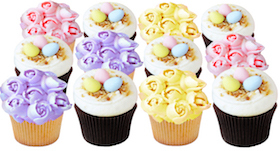 Georgetown Cupcake's Easter Dozen is a collection of 12 different flavors: 1 Carrot, 1 Cherry Blossom, 1 Coconut with a fondant baby chick, 1 'Easter Bunny' Peanut Butter Fudge, 1 'Easter Egg' Vanilla Confetti & Sunshine Buttercream, 1 Chocolate Caramel Easter Bunny, 1 'Happy Easter' Red Velvet, 1 Vanilla Confetti Easter Egg, 1 'Easter Bunny' Salted Caramel, 1 Hummingbird, 1 'Easter Egg' Lavender Earl Grey Teacake, and 1 Cherry Cheesecake cupcake. Available April 1st - April 30th. Georgetown Cupcake's Easter Celebration Dozen includes 6 Easter Nest cupcakes (Valrhona chocolate cupcakes filled with dulce de leche caramel and topped with a Callebaut white chocolate buttercream frosting, a toasted coconut nest, and candy-coated chocolate Easter eggs), and 2 Pink Tulip cupcakes, 2 Purple Tulip cupcakes, and 2 Yellow Tulip cupcakes (Madagascar Bourbon vanilla cupcakes frosted with Madagascar Bourbon vanilla buttercream pastel pink, yellow, and purple tulips). Available April 1st – April 30th. Georgetown Cupcake's Bunnies & Eggs Dozen includes 3 Chocolate Caramel Easter Bunny cupcakes, 3 Vanilla Confetti Easter Egg cupcakes, 3 caramel-filled chocolate cupcakes with light purple vanilla buttercream and yellow fondant Easter bunnies, and 3 Vanilla Confetti cupcakes with light yellow buttercream and fondant Easter Eggs. Available April 1st - April 30th. 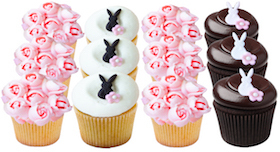 Georgetown Cupcake's Bunnies and Blossoms Dozen includes 3 White Chocolate Easter Bunny cupcakes, 3 Chocolate Squared cupcakes decorated with white fondant Easter Bunnies and pink fondant blossoms, and 6 Pink Tulip cupcakes (Madagascar Bourbon vanilla cupcakes frosted with Madagascar Bourbon vanilla buttercream pastel pink tulips). Available April 1st - April 30th. 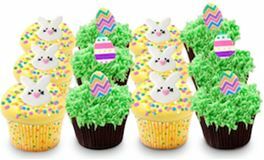 Georgetown Cupcake’s Hoppy Easter Dozen includes 6 Vanilla Confetti Bunny Face cupcakes and 6 Easter Egg Hunt Chocolate cupcakes. Available April 1st - April 30th. Georgetown Cupcake's Spring Dozen is a collection of 12 different flavors: 1 Carrot, 1 Cherry Blossom, 1 Coconut with a fondant baby chick, 1 'Butterfly' Peanut Butter Fudge, 1 'Spring Bloom' Vanilla Confetti & Sunshine Buttercream, 1 Caramel-Filled 'Butterfly' Chocolate, 1 'Bumblebee' Red Velvet, 1 'Spring Bloom' Vanilla Confetti, 1 'Butterfly' Salted Caramel, 1 Hummingbird, 1 Lavender Earl Grey Teacake, and 1 Cherry Cheesecake cupcake. Available April 1st – April 30th. 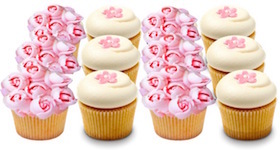 Georgetown Cupcake's Cherry Blossom Celebration Dozen includes 3 Cherry Blossom cupcakes, 3 Cherry Cheesecake cupcakes, and 6 Pink Tulip cupcakes. Available March 1st through April 30th. Georgetown Cupcake's Limited Edition Mother's Day Heart Dozen includes a beautiful assortment of 12 different flavors packaged in a pink keepsake heart-shaped gift box: 1 sparkling Raspberry Lemonade cupcake, 1 White Chocolate Raspberry cupcake, 1 Salted Caramel cupcake, 1 Lavender Earl Grey Teacake cupcake, 1 Pink Rose Vanilla & Buttercream cupcake, 1 Marble Brownie Fudge Cheesecake cupcake, 1 MOM Vanilla & Baby Pink Vanilla Buttercream cupcake, 1 Red Velvet cupcake, 1 MOM Valrhona Chocolate & Baby Pink Vanilla Buttercream cupcake, 1 Vanilla Butterfly Surprise cupcake, 1 Raspberry Swirl Cheesecake cupcake, and 1 Peanut Butter Fudge cupcake, all decorated with a beautiful assortment of handmade pink and gold fondant Mother's Day-themed fondant decorations. Available May 1st – May 31st. 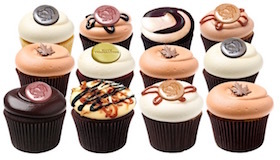 Georgetown Cupcake's Mother's Day Dozen includes a beautiful assortment of 12 different flavors: 1 Salted Caramel cupcake, 1 sparkling Raspberry Lemonade cupcake, 1 Lavender Earl Grey Teacake cupcake, 1 Vanilla Butterfly Surprise cupcake, 1 MOM Vanilla & Baby Pink Vanilla Buttercream cupcake, 1 Red Velvet cupcake, 1 MOM Valrhona Chocolate & Baby Pink Vanilla Buttercream cupcake, 1 Marble Brownie Fudge Cheesecake cupcake, 1 Raspberry Swirl Cheesecake cupcake, 1 Peanut Butter Fudge cupcake, 1 White Chocolate Raspberry cupcake, and 1 Pink Rose Vanilla & Buttercream cupcake, all decorated with a beautiful assortment of handmade pink and gold fondant Mother's Day-themed fondant decorations. Available May 1st – May 31st. Georgetown Cupcake's Garden Party Dozen includes a beautiful assortment of 12 different flavors: 1 Salted Caramel cupcake, 1 sparkling Raspberry Lemonade cupcake, 1 Lavender Earl Grey Teacake cupcake, 1 Vanilla Butterfly Surprise cupcake, 1 Vanilla & Baby Pink Vanilla Buttercream cupcake, 1 Red Velvet cupcake, 1 Valrhona Chocolate & Baby Pink Vanilla Buttercream cupcake, 1 Marble Brownie Fudge Cheesecake cupcake, 1 Raspberry Swirl Cheesecake cupcake, 1 Peanut Butter Fudge cupcake, 1 White Chocolate Raspberry cupcake, and 1 Pink Rose Vanilla & Buttercream cupcake, all decorated with a beautiful assortment of handmade pink and gold fondant garden and heart-themed fondant decorations. Available May 1st – May 31st. 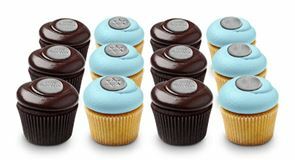 Georgetown Cupcake's Class of 2019 Graduation Dozen includes 12 different flavors: 1 Lava Fudge cupcake, 1 Chocolate Squared cupcake, 1 Chocolate Birthday cupcake, 1 Cookies & Crème cupcake, 1 Vanilla & Chocolate cupcake, 1 Double Milk Chocolate Birthday cupcake, 1 Peanut Butter Fudge cupcake, 1 Vanilla Rainbow cupcake, 1 Vanilla Birthday cupcake, 1 Red Velvet cupcake, 1 Milk Chocolate Birthday cupcake, and 1 Salted caramel cupcake, decorated with gold 'Class of 2019' medallions, gold stars, white diplomas, and black graduation cap fondant. Available May 1st – June 30th. 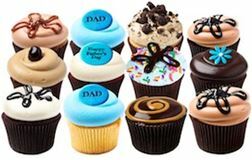 Georgetown Cupcake's Father's Day Dozen is a collection of 12 different flavors and includes 1 Salted Caramel, 1 ‘DAD’ Chocolate & Light Blue Buttercream, 1 Caramel Cookies & Crème, 1 Peanut Butter Fudge, 1 Mocha Chocolate Chip, 1 Red Velvet with ‘Happy Father’s Day’ fondant, 1 Cookies & Crème Birthday Fudge, 1 Chocolate Squared, 1 Lava Fudge, 1 ‘DAD’ Vanilla & Light Blue Buttercream, 1 Chocolate Peanut Butter Cheesecake, and 1 Peanut Butter Banana Marshmallow Fudge. Available June 1st – June 30th. 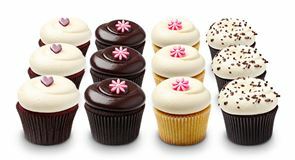 Georgetown Cupcake's 4th of July Dozen is a patriotic assortment of 12 different flavors: 1 Vanilla Firework Swirl cupcake, 1 German Chocolate Fudge, 1 Red White & Blue Vanilla Surprise cupcake, 1 Peanut Butter Fudge cupcake, 1 Red Velvet cupcake, 1 Chocolate Squared cupcake, 1 Chocolate & Vanilla cupcake, 1 Vanilla & Chocolate cupcake, 1 Blueberry Cheesecake cupcake, 1 Salted Caramel cupcake, 1 Chocolate Firework Swirl cupcake, and 1 Lava Fudge cupcake, decorated with an assortment of US flag and patriotic-themed fondant decorations. Available July 1st – July 31st. 3 Red Velvet cupcakes with red fondant stars, 3 Chocolate Squared cupcakes with fondant US flags, 3 Vanilla & Buttercream cupcakes with blue fondant stars, and 3 Chocolate & Vanilla cupcakes with fondant US flags. Available July 1st – July 31st. Georgetown Cupcake's Beach Dozen includes 2 Mermaid Vanilla cupcakes, 2 Tropical Flower Vanilla cupcakes, 2 Red Velvet cupcakes decorated with gold sanding sugar and gold fondant palm trees, 2 Pink Flamingo cupcakes, 2 Triple Caramel Beach cupcakes decorating with fondant starfish, and 2 Chocolate & Hot Pink Buttercream cupcakes decorated with gold sanding sugar and gold fondant pineapples. Available July 1st – July 31st. 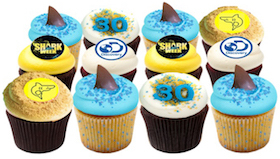 Georgetown Cupcake’s 2018 Shark Week 30th Anniversary Dozen includes 4 Shark Fin Vanilla cupcakes (Madagascar vanilla cupcakes infused with sparkling blue sanding sugar and topped with ocean blue vanilla buttercream, sparkling blue sanding sugar and fondant shark fins), 2 Triple Caramel Beach cupcakes (salted caramel cupcakes filled with dulce de leche caramel, topped with salted caramel buttercream, graham cracker crumb sand ,and fondant Shark Week logo sharks), 2 Chocolate Sunshine cupcakes (Valrhona chocolate cupcakes topped with sunshine vanilla buttercream and Shark Week logo fondant, 2 Red Velvet cupcakes with Discovery logo fondant, and 2 Valrhona Chocolate & Vanilla Buttercream cupcakes topped with sparkling blue and yellow sanding sugar, and fondant “30”s. Available July 1st–July 31st. 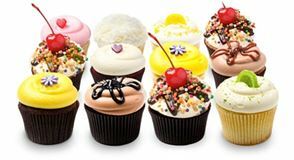 Georgetown Cupcake's Summer Dozen is a collection of 12 different flavors and includes 1 Strawberry cupcake, 1 Coconut cupcake, 1 Lemon Blossom cupcake, 1 Banana Split cupcake, 1 Caramel Sundae cupcake, 1 Red Velvet cupcake, 1 Vanilla & Sunshine Buttercream cupcake, 1 Salted Caramel cupcake, 1 Chocolate & Sunshine Buttercream cupcake, 1 Peanut Butter Fudge cupcake, 1 Chocolate Sundae cupcake, and 1 Key Lime cupcake. Available June 1st – August 31st. 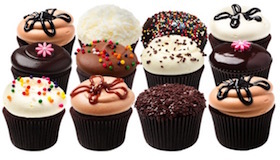 Georgetown Cupcake's Sundae Dozen is a delicious assortment of 4 different flavors: 3 Strawberry Sundae cupcakes, 3 Chocolate Sundae cupcakes, 3 Butterscotch Waffle Cone cupcakes, and 3 Banana Split cupcakes. Available August 1st – August 31st. 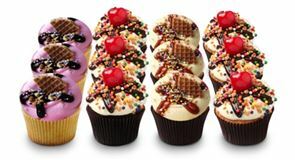 Georgetown Cupcake’s NEW Fun in the Sun Dozen includes 1 Strawberry Sundae cupcake, 1 Blueberry Cheesecake cupcake, 1 Mermaid Vanilla cupcake, 1 Red Velvet cupcake, 1 Salted Caramel cupcake, 1 Double Milk Chocolate Birthday cupcake, 1 Strawberry Lemonade cupcake, 1 Butterscotch Waffle Cone cupcake, 1 Key Lime Cheesecake cupcake, 1 Peanut Butter Fudge cupcake, 1 Banana Split cupcake, and 1 Confetti Cone cupcake. Available August 1st – August 31st. 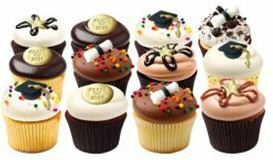 Georgetown Cupcake's Back-To-School Dozen includes: 1 Chocolate Squared, 1 Caramel Apple, 1 Double Milk Chocolate Birthday, 1 Salted Caramel, 1 Vanilla Birthday, 1 Red Velvet, 1 Peanut Butter Fudge, 1 Cookies & Crème Cheesecake, 1 Salted Caramel Chocolate Chip, 1 Chocolate Ganache Surprise, 1 PB&J, and 1 Lava Fudge, decorated with an assortment of Back-To-School themed fondant decorations. Available September 1st – September 30th. 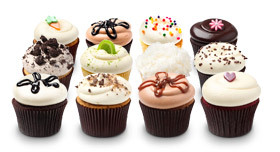 Georgetown Cupcake's September Favorites Dozen is an assortment of Georgetown Cupcake's September seasonal flavors and most popular classic flavors and includes: 1 Peanut Butter Fudge Cheesecake, 1 Chocolate Ganache Surprise, 1 Salted Caramel Chocolate Chip, 1 Caramel Apple, 1 Red Velvet, 1 Unicorn, 1 Lava Fudge, 1 Cookies & Crème Cheesecake, 1 Salted Caramel, 1 PB&J, 1 Rainbow, and 1 Peanut Butter Fudge. Available September 1st – September 30th. 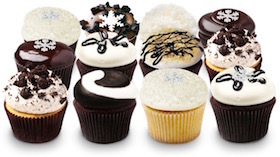 Georgetown Cupcake's Chocolate Lovers Dozen includes 12 of Georgetown Cupcake's most decadent chocolate-y flavors: 1 Peanut Butter Fudge Cheesecake, 1 Chocolate Coconut, 1 Chocolate Ganache Surprise, 1 Lava Fudge, 1 Chocolate Squared, 1 Double Milk Chocolate Birthday, 1 Chocolate & Vanilla, 1 Chocolate Ganache, 1 Chocolate Birthday, 1 Chocolate Salted Caramel, 1 Chocolate Cubed, and 1 Peanut Butter Fudge. Available September 1st – September 30th. 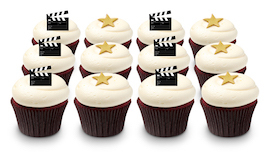 Georgetown Cupcake's Red Carpet Red Velvet Dozen includes 12 red velvet cupcakes decorated with alternating columns of Hollywood clapperboard fondant and sparkling gold star fondant. 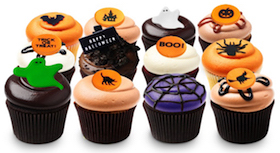 Georgetown Cupcake's 2018 Trick or Treat Dozen is a collection of 12 different Halloween-inspired flavors: 1 Vanilla Bat cupcake, 1 Pumpkin Spice Haunted House cupcake, 1 Chocolate Ghost cupcake, 1 Salted Caramel Jack-o-Lantern cupcake, 1 Lava Fudge "Trick or Treat" cupcake, 1 Midnight Cookies & Crème "Happy Halloween" cupcake, 1 Red Velvet "BOO!" 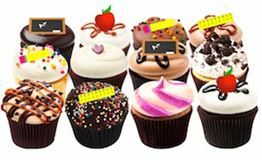 cupcake, 1 Vanilla Candy Spider cupcake, 1 Chocolate Green Ghost cupcake (stuffed inside with green-tinted vanilla buttercream), 1 Pumpkin Cheesecake Black Cat cupcake (with a graham cracker crust), 1 Chocolate Toffee Spider Web cupcake, and 1 Peanut Butter Fudge Witch cupcake. Available October 1st – October 31st. 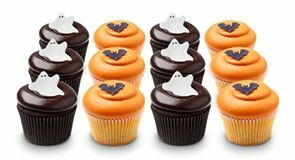 Georgetown Cupcake's Bats & Ghosts Dozen includes 6 Vanilla Bat cupcakes and 6 Chocolate Ghost cupcakes. Available October 1st – October 31st. 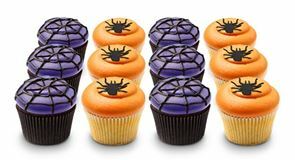 Georgetown Cupcake's Spiders & Webs Dozen includes 6 Vanilla Candy Spider cupcakes and 6 Chocolate Toffee Spider Web cupcakes. Available October 1st – October 31st. 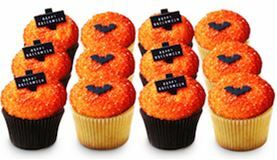 Georgetown Cupcake's NEW Happy Halloween Dozen includes 6 Valrhona chocolate cupcakes with Halloween orange-tinted Madagascar vanilla buttercream frosting, covered in sparkling orange sanding sugar, and "Happy Halloween" sign fondant decorations and 6 Madagascar vanilla cupcakes with Halloween orange-tinted Madagascar vanilla buttercream frosting and black fondant bat decorations. Available October 1st – October 31st. 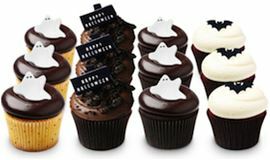 Georgetown Cupcake's NEW Haunted Dozen includes 3 Halloween Surprise cupcakes, 3 Midnight Cookies & Crème cupcakes, 3 Haunted Chocolate Cheesecake cupcakes (Valrhona chocolate cheesecakes with chocolate cookie crusts and whipped Callebaut Chocolate ganache frosting), and 3 Vampire Red Velvet cupcakes. Available October 1st – October 31st. 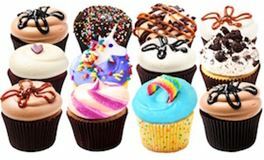 Make the world a sweeter place by supporting National Bullying Prevention Month. 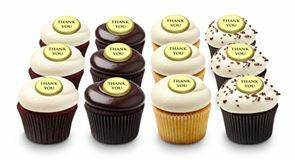 For every “Give A Little” Chocolate & Buttercream Dozen purchased during the month of October, TLC will donate $12 to Love is Louder. 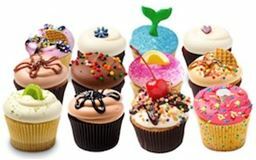 This dozen includes 12 Valrhona chocolate cupcakes topped with a Madagascar vanilla buttercream, red and white sprinkles, and a “Give A Little” fondant decorations. 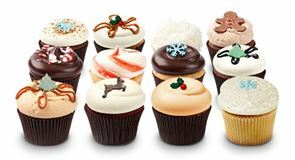 Georgetown Cupcake's Thanksgiving Dozen includes: 1 Vanilla & Buttercream cupcake, 1 Peanut Butter Fudge cupcake, 1 Chocolate Caramel Swirl cupcake, 1 Salted Caramel cupcake, 1 Pumpkin Spice cupcake, 1 Red Velvet cupcake, 1 Pumpkin Cheesecake cupcake, 1 Chocolate & Buttercream cupcake, 1 Chocolate Squared cupcake, 1 German Chocolate Fudge cupcake (chocolate cupcake with a caramel and pecan core, topped with a caramel buttercream frosting, toasted coconut flakes and a fudge and caramel drizzle), 1 Caramel Apple cupcake, and 1 Maple Chocolate Chip cupcake, decorated with an assortment of handmade fondant leaves and Thanksgiving-themed decorations in beautiful autumn colors. 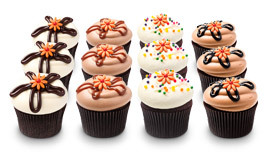 Georgetown Cupcake's Fall Favorites Dozen includes: 1 Vanilla & Buttercream cupcake, 1 Peanut Butter Fudge cupcake, 1 Chocolate Caramel Swirl cupcake, 1 Salted Caramel cupcake, 1 Pumpkin Spice cupcake, 1 Red Velvet cupcake, 1 Pumpkin Cheesecake cupcake, 1 Chocolate & Buttercream cupcake, 1 Chocolate Squared cupcake, 1 German Chocolate Fudge cupcake (chocolate cupcake with a caramel and pecan core, topped with a caramel buttercream frosting, toasted coconut flakes and a fudge and caramel drizzle), 1 Caramel Apple cupcake, and 1 Maple Chocolate Chip cupcake, decorated with an assortment of handmade fondant leaves in beautiful autumn colors. 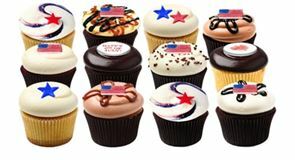 Georgetown Cupcake's Democrat Dozen includes 6 Red Velvet cupcakes decorated with Democrat Donkey fondant, 3 Chocolate Squared cupcakes decorated with US flag fondant, and 3 Vanilla & Buttercream cupcakes decorated with US flag fondant. Available September 1st – November 30th. 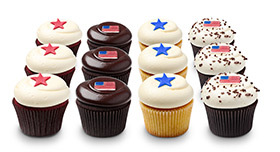 Georgetown Cupcake's Republican Dozen includes 6 Red Velvet cupcakes decorated with Republican Elephant fondant, 3 Chocolate Squared cupcakes decorated with US flag fondant, and 3 Vanilla & Buttercream cupcakes decorated with US flag fondant. Available September 1st – November 30th. 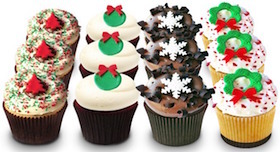 Georgetown Cupcake's Christmas Collection Dozen is a collection of 12 different classic Christmas-inspired flavors: 1 Chocolate Egg Nog cupcake, 1 Sticky Toffee Pudding cupcake, 1 Snowball Coconut cupcake, 1 Gingerbread cupcake, 1 Chocolate Peppermint cupcake, 1 White Chocolate Peppermint cupcake, 1 Santa's Chocolate Chip cupcake, 1 Holiday Lava Fudge cupcake, 1 Rudolph Red Velvet cupcake, 1 Christmas Caramel cupcake, 1 Christmas Butterscotch Cheesecake cupcake, and 1 Snowy Vanilla & Buttercream cupcake, decorated with a beautiful assortment of glittering handmade Christmas fondant decorations. Available December 1st – December 31st. 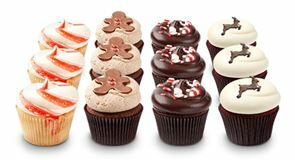 Georgetown Cupcake's Santa's Favorites Dozen includes 3 Santa's Chocolate Chip cupcakes (Madagascar vanilla cupcakes studded with Callebaut chocolate chips and a whipped Callebaut chocolate ganache frosting) decorated with 'Ho! Ho! Ho!' fondant, 3 Snowy Vanilla & Buttercream cupcakes decorated with sparkling sanding sugar and 'North Pole' sign post fondant, 3 'Reindeer Munch Crunch' cupcakes (Valrhona chocolate cupcakes with peppermint chocolate ganache centers, frosted with Callebaut white chocolate peppermint buttercream frosting, and topped with crushed peppermint and a drizzle of peppermint chocolate ganache), and 3 Red Velvet cupcakes decorated with 'Santa sleigh silhouette' fondant. Available December 1st – December 31st. 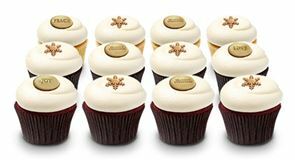 Georgetown Cupcake's Mrs. Claus' Favorites Dozen features Georgetown Cupcake's NEW holiday flavors and includes 3 Christmas Cookie cupcakes decorated with red and brown fondant Christmas cookies, 3 Red Velvet cupcakes decorated with green ‘Merry Christmas’ ornaments, 3 Mrs. Claus’ Cocoa cupcakes decorated with white fondant snowflakes, and 3 White Chocolate Peppermint Cheesecake cupcakes decorated with green fondant wreaths. Available December 1st – December 31st. Georgetown Cupcake's Happy Holidays Dozen includes 3 White Chocolate Peppermint cupcakes with candy cane-swirled white chocolate peppermint buttercream frosting, 3 Gingerbread cupcakes with cinnamon cream cheese frosting and glittering handmade fondant gingerbread men, 3 Valrhona Chocolate Peppermint cupcakes topped with a whipped Callebaut chocolate peppermint ganache frosting and crushed peppermint, and 3 Rudolph Red Velvet cupcakes, decorated with glittering handmade fondant red-nosed reindeer. Available December 1st – December 31st. Georgetown Cupcake's Season's Greetings Dozen includes 4 Madagascar vanilla cupcakes with Madagascar vanilla buttercream frosting, 4 classic Red Velvet cupcakes with vanilla cream cheese frosting, and 4 Valrhona chocolate cupcakes with Madagascar vanilla buttercream frosting, all decorated with a beautiful assortment of handmade glittering gold fondant Season’s Greetings, PEACE, LOVE, JOY and snowflake decorations. Available December 1st – December 31st. 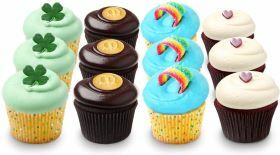 Georgetown Cupcake's Happy Hanukkah Dozen includes 6 Madagascar vanilla cupcakes with icy blue Madagascar vanilla buttercream frosting and and 6 Valrhona Chocolate Squared cupcakes all decorated with handmade glimmering silver 'Happy Hanukkah', Star of David, and menorah fondant decorations. Available December 1st – December 31st. 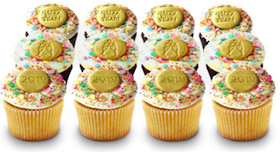 Georgetown Cupcake's 2019 Happy New Year Dozen includes 4 Valrhona Chocolate & Madagascar Bourbon Vanilla Buttercream cupcakes, 4 Red Velvet cupcakes, and 4 Madagascar Bourbon Vanilla & Madagascar Bourbon Vanilla Buttercream cupcakes, decorated with edible New Year's party confetti and handmade glittering gold ‘Happy New Year’, ‘2019’, and champagne glasses embossed fondant medallions. 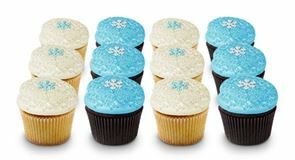 Georgetown Cupcake's Wintry Mix Dozen includes 12 delicious flavors: 1 Chocolate & Vanilla Buttercream cupcake topped with sparkling sanding sugar and a white fondant snowflake, 1 Hot Cocoa cupcake, 1 Chocolate Coconut cupcake, 1 Chocolate Squared cupcake with a white fondant snowflake, 1 Chocolate S'More Chip cupcake, 1 Lava Fudge cupcake, 1 Chocolate S’more Cheesecake cupcake, 1 Cookies & Crème cupcake, 1 Cookies & Crème Cheesecake cupcake, 1 Black & White cupcake (chocolate cupcake studded with white chocolate chips and topped with a white chocolate buttercream and whipped chocolate ganache twist frosting), 1 Vanilla & Vanilla Buttercream cupcake topped with sparkling sanding sugar and a white fondant snowflake, and 1 Chocolate Marshmallow Fudge cupcake with a white fondant snowflake. Georgetown Cupcake's Winter Wonderland Dozen includes 6 Madagascar vanilla cupcakes with Madagascar vanilla buttercream frosting, sparkling sanding sugar, and handmade glimmering icy blue snow!ake fondant decorations, and 6 Valrhona chocolate cupcakes with icy blue Madagascar vanilla buttercream frosting, sparkling sanding sugar, and handmade glimmering icy white snowflake fondant decorations. Georgetown Cupcake's Valentine’s Heart Dozen is a collection of 12 Valentine’s-inspired flavors: 1 ‘sweetheart’ Strawberry Lava Fudge, 1 Chocolate Squared, 1 ‘love’ Lava Fudge, 1 Strawberry Cheesecake (with a graham cracker crust), 1 Red Velvet, 1 Valentine’s ‘xo’ Vanilla & Baby Pink Buttercream, 1 Red Velvet Swirl Cheesecake, 1 Valentine’s ‘xo’ Chocolate & Bubblegum Pink Buttercream, 1 ‘be mine’ Peanut Butter Fudge, 1 Raspberry Chocolate Chip, 1 Strawberry, and 1 ‘Cupid’ Salted Caramel, packaged in a Limited Edition Georgetown Cupcake pink heart gift box. Available February 1st – February 28th. 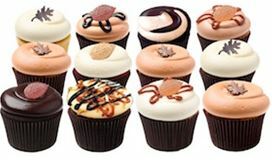 Georgetown Cupcake's Valentine’s Day Dozen is a collection of 12 Valentine’s-inspired flavors: 1 ‘sweetheart’ Strawberry Lava Fudge, 1 Chocolate Squared, 1 ‘love’ Lava Fudge, 1 Strawberry Cheesecake (with a graham cracker crust), 1 Red Velvet, 1 Valentine’s ‘xo’ Vanilla & Baby Pink Buttercream, 1 Red Velvet Swirl Cheesecake, 1 Valentine’s ‘xo’ Chocolate & Bubblegum Pink Buttercream, 1 ‘be mine’ Peanut Butter Fudge, 1 Raspberry Chocolate Chip, 1 Strawberry, and 1 ‘Cupid’ Salted Caramel. Available February 1st – February 28th. Georgetown Cupcake's Be Mine Dozen includes 3 Red Velvet Cheesecake cupcakes, 3 Teddy Bear Red Velvet cupcakes, 2 Chocolate Squared cupcakes with fondant ‘valentine envelopes’, 2 Vanilla & Vanilla Buttercream cupcakes with ‘xo’ fondant hearts, and 2 Lava Fudge cupcakes with ‘xo’ fondant hearts. Available February 1st – February 28th. Georgetown Cupcake's Rose Gold Dozen includes 3 Chocolate & Baby Pink Vanilla Buttercream cupcakes, covered in clear and gold sanding sugar and decorated with ‘love’ embossed gold fondant medallions, 3 Vanilla & Baby Pink Vanilla Buttercream ‘Pink Rose’ cupcakes, 3 Chocolate Squared cupcakes decorated with gold and pink fondant hearts, and 3 Vanilla & Baby Pink Vanilla Buttercream cupcakes, covered in clear and gold sanding sugar and decorated with ‘xo’ embossed gold fondant medallions and hearts. Available February 1st – February 28th. Georgetown Cupcake's Unicorns & Kisses Dozen includes 6 Valentine Unicorn cupcakes (Madagascar vanilla cupcakes with baby pink vanilla buttercream, infused and topped with Valentine's candy nonpareils and fondant Valentine unicorns blowing kisses) and 6 Valentine's 'xo' Chocolate cupcakes (Valrhona chocolate cupcakes with bubblegum pink vanilla buttercream, Valentine's candy nonpareils, and 'xo' fondant). Avaiilable February 1st - February 28th. Georgetown Cupcake's St. Patric's Dozen includes 12 different flavors: 1 St. Patrick's Vanilla & Buttercream, 1 Peanut Butter Chocolate Chip Twist, 1 Mocha Chocolate Chip Cheesecake, 1 Chocolate Mint Crunch, 1 Peanut Butter Fudge, 1 Red Velvet, 1 Rainbow, 1 St. Patrick's Chocolate & Buttercream, 1 non-alcoholic Baileys Chocolate Mint (made with non-alcoholic Baileys essence), 1 Chocolate Squared, 1 Mint Cookies & Créme and 1 Salted Caramel, decorated with an assortment of handmade St. Patrick's Day themed fondant. Available March 1st – March 31st. Georgetown Cupcake's Lucky Dozen includes 3 St. Patrick's Vanilla cupcakes, 3 Chocolate Squared cupcakes decorated with gold embossed 'Pot 'o Gold' fondant medallions, 3 Rainbow cupcakes, and 3 Red Velvet cupcakes . Available March 1st - March 31st. 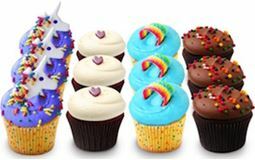 Georgetown Cupcake's Rainbows & Unicorns Dozen includes 3 Unicorn cupcakes, 3 Red Velvet cupcakes, 3 Rainbow cupcakes, and 3 Double Milk Chocolate Birthday cupcakes. Available January 1st - January 31st. 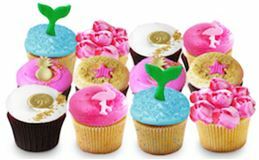 Georgetown Cupcake's 2018 10th Anniversary Dozen includes 2 Red Velvet cupcakes, 2 Vanilla & Baby Pink Vanilla Buttercream cupcakes, 2 Chocolate & Bubblegum Pink Buttercream cupcakes, 2 Chocolate & Chocolate Buttercream cupcakes, 2 Vanilla & Baby Pink Buttercream ’Pink Rose’ cupcakes, and 2 Salted Caramel cupcakes, decorated with sparkling sanding sugar and confetti, and gold and pink fondant hearts. 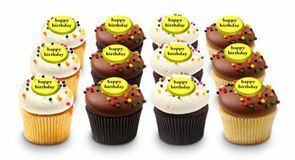 Each cupcake topped with a gold spiral (non-edible) birthday candle. 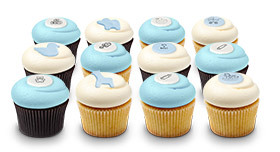 3 chocolate cupcakes with baby blue buttercream, 3 chocolate cupcakes with vanilla buttercream, 3 vanilla cupcakes with baby blue buttercream and 3 vanilla cupcakes with vanilla buttercream, topped with an assortment of baby blue and white baby-themed fondant decorations. 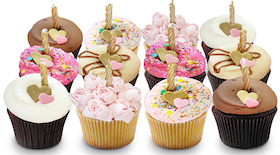 3 chocolate cupcakes with baby pink buttercream, 3 chocolate cupcakes with vanilla buttercream, 3 vanilla cupcakes with baby pink buttercream and 3 vanilla cupcakes with vanilla buttercream, topped with an assortment of pink and white baby-themed fondant decorations. 3 chocolate cupcakes with baby yellow buttercream, 3 chocolate cupcakes with vanilla buttercream, 3 vanilla cupcakes with baby yellow buttercream and 3 vanilla cupcakes with vanilla buttercream, topped with an assortment of baby yellow and white baby-themed fondant decorations. 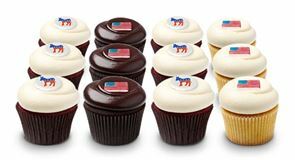 Georgetown Cupcake's Democrat Dozen includes 6 Red Velvet cupcakes decorated with Democrat Donkey fondant, 3 Chocolate Squared cupcakes decorated with US flag fondant, and 3 Vanilla & Buttercream cupcakes decorated with US flag fondant. 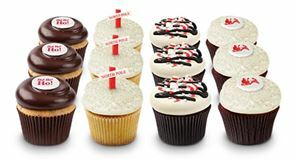 Georgetown Cupcake's Republican Dozen includes 6 Red Velvet cupcakes decorated with Republican Elephant fondant, 3 Chocolate Squared cupcakes decorated with US flag fondant, and 3 Vanilla & Buttercream cupcakes decorated with US flag fondant.